A melodramatic romance story with Hawaiian music, hula dancing, and and a volcano erupting. Could you believe that a Broadway show introduced mainland Americans to Hawaii in the early 1900s? In "The Bird of Paradise," Luana, a Hawaiian princess, falls in love with Dr. Paul Wilson. The medical doctor saves the Hawaiian people from leprosy: he isolates its germs and sacrifices himself to the volcano god, and a volcano erupts. Throughout this play, hula dancers sway their hips and move their hands and feet to Hawaiian chanting and music. The five Hawaiian male singers Kolomoku, Waiwaiole, Kaiawe, Kawala and Aoka sing songs including "Mauna Kea," "Waialae," and "Ku'u Home" ("Old Plantation") and play instruments including a guitar, 'ukulele, steel guitar, ipu, and other traditional Hawaiian instruments. From 1912 to 1924, "The Bird of Paradise" performed 112 shows mostly in New York, but also toured to other cities, including Tacoma, Washington; Eugene, Oregon; and Salt Lake City, Utah. 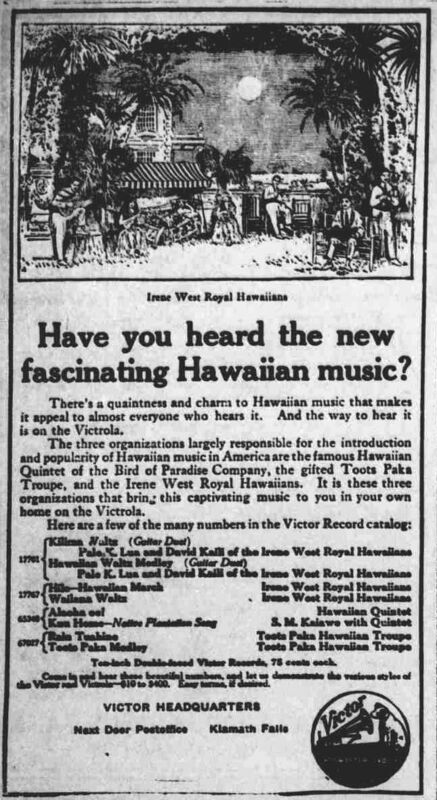 The Broadway show popularized Hawaiian music in United States, Canada, and Europe in the first quarter of the 1900s, and Tin Pan Alley produced the wildly popular "Hawaiian" music records. 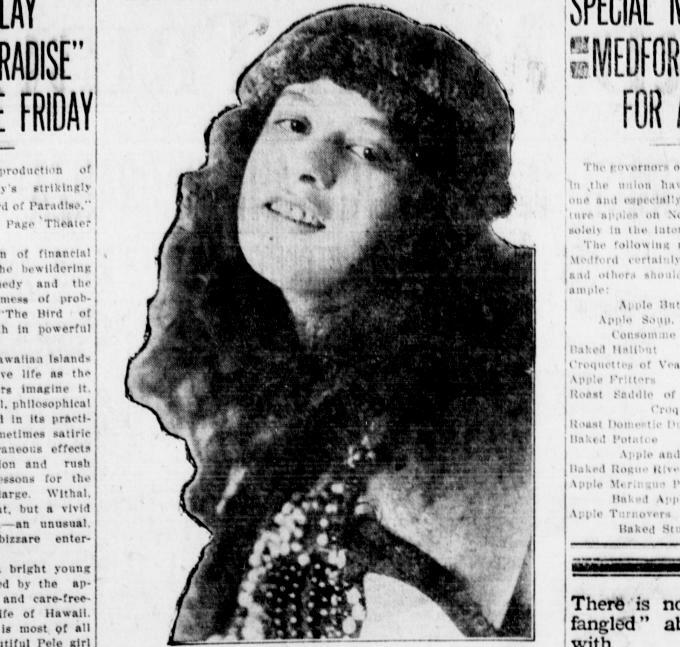 "The Bird of Paradise" debuted at Daly's Theater in New York on January 8, 1912. Simulating the warm, tropical atmosphere of Hawaii, the play briefly relieved the audience from the winter weather. "For three hours you live in Hawaii, not because the programme tells you so, but because the illusion is perfect. Here is the 'atmosphere' of place and people. It is pleasant in our icy days to be transported to this tropic land, to leave for a while our religion of hustle, our shrine of the dollar, and go where life moves gently, dreamily, amid soft, caressing airs." 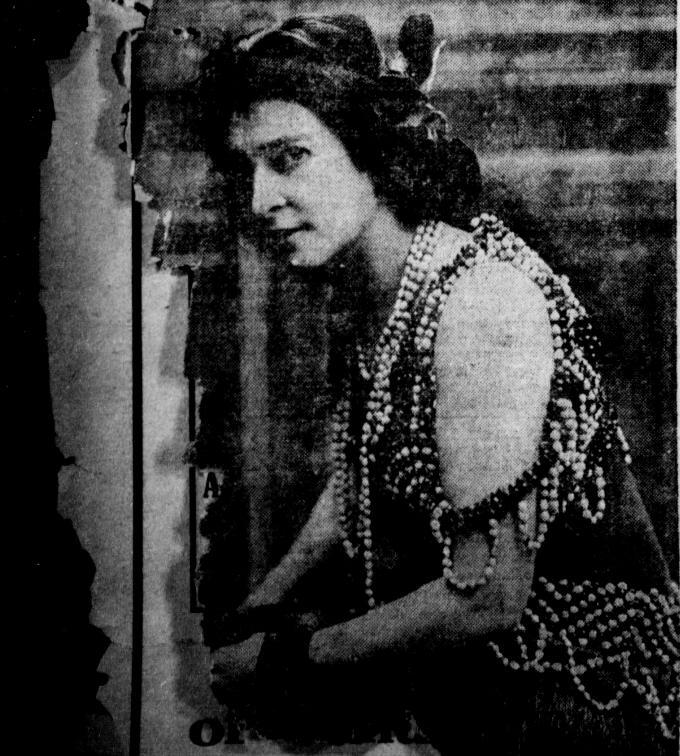 The New-York Tribune also says the scenic effects were "both fascinating and impressive; the native life and spirit are so well suggested that they permeate the play, and the snatches of native music haunt the ear." 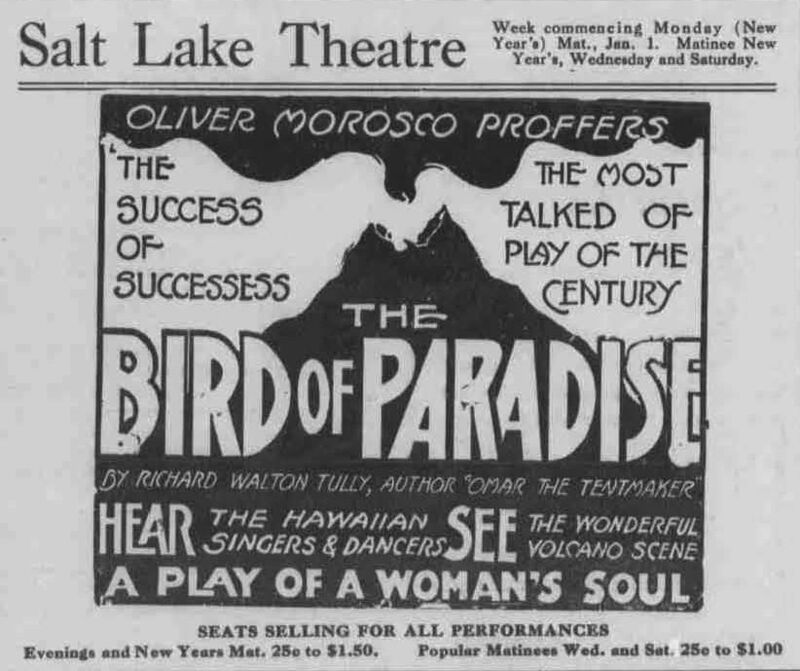 "The Bird of Paradise" also performed at Salt Lake City, and Goodwin's Weekly notes, "It touches a virgin field, so far as the stage world is concerned, and it is probably the one worthy attempt to date to preserve in dramatic form and therefore to visualize the vanishing customs, beliefs and legends of the Hawaiians." "The Bird of Paradise" shaped mainland Americans' perceptions of Hawaii. 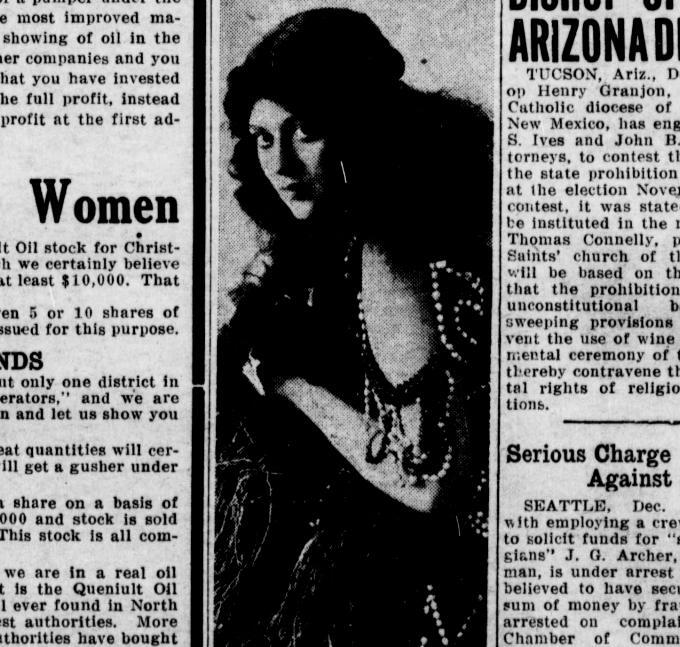 The Medford Mail Tribune describes the native life of Hawaii as carefree and the "native girl" Luana's inborn traits as desiring "indolence," the "Kanaka intoxicants," and "primitive life." Note: "The Bird of Paradise" incorporated Hawaiian words into the script: pau (finished), wiki wiki (hurry up, quick), pana hana (work), aloha (greetings), nui (love to you), and pilikea (trouble). "The Drama: 'The Bird of Paradise' at Daly's Theatre"